LabChart software is specifically designed for working with medical physiology data. 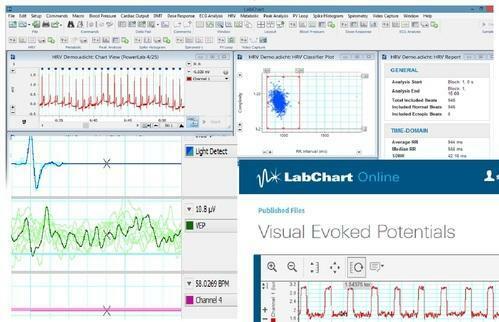 Simple to use and suitable for a broad range of signal types, LabChart's broad set of features makes it easy and fast to record, display and parameterize data. LabChart's range of sophisticated Add-Ons are purpose-built for signals specific to life science, e.g. cardiovascular, respiratory, blood pressure, neuronal and dose response data. We, ADInstruments South Asia India Private Limited, are well known and most leading firm established in the year 2004, at Barakhamba Road, (New Delhi, India). We are leading and foremost Manufacturer and Supplier of Instruments, Transducers and Accessories & Parts. The offered array of products is elite and quality assured. Our products are for research and education are as per the latest MCI guidelines. They are smooth finished and very easy to install. They are compact in design and light weighted. We have a team of qualified professionals and engineers that work very hard in order to design these qualities assured products. They are manufactured with outmost sincerity and conformity. Furthermore, we make use of advanced techniques and skills in order to keep it compliance with international level. The offered products are available in many speculations and specifications. In order to keep the delivery and products up to the exact level, we also offer this array in customizations options. Our offered products are highly appreciated and loved by our customers for many reasons like quality assurance, durability, compact design, easy installation, smooth finish, sturdy design, optimum performance and low maintenance.